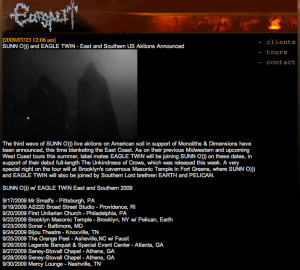 We are pleased to now be working with EarSplit PR in North America. They will be handling all press and promotion for the upcoming release of Forgive Us Our Trespasses, coming out soon on Neurot Recordings. Earsplit works with some great bands and labels, including Southern Lord, Wolves in the Throneroom, Pelican, Sunno: Translation Loss, Bloodhorse; Exhile on Mainstream, etc.